Dit jaar viert Nikon de tachtigste verjaardag van haar Nikkor lenzen. En in november vorig jaar werd nog gevierd dat de 75 miljoenste Nikkor van de band rolde. Dat roept de vraag op waar de naam ‘Nikkor’ eigenlijk vandaan komt, te meer omdat het bedrijf zelf Nikon heet. Het begon allemaal in 1932. Nikon heette toen nog ‘Nippon Kogaku K.K’. Destijds was toevoeging van een ‘R’ aan de merknaam een veelvoorkomende praktijk bij de naamgeving van objectieven. De naam Nikkor is dus afgeleid van Nippon. De naam Nikkor werd voor het eerst gebruikt in 1933 voor een grootformaatobjectief voor luchtfotografie; de naam Aero-NIKKOR. Dat is nu dus tachtig jaar geleden. In eerste instantie bewaarde men de Nikkor-naam voor hun optica van de hoogste kwaliteit, maar tegenwoordig zijn alle Nikonlenzen van het merk Nikkor. De eerste Nikon camera verscheen overigens pas 26 jaar later, in 1959. TOKYO – Nikon Corporation celebrates the 80th anniversary of the launch of its NIKKOR photographic lenses this year. In commemoration of NIKKOR’s 80th anniversary, Nikon hopes to strengthen and increase awareness of the historic and reliable NIKKOR brand with various promotions in 2013. The first step toward achieving this objective is the creation of a NIKKOR 80th anniversary logo that will be used in Nikon product brochures, advertisements, and various other forms of communication. The anniversary logo will embody NIKKOR’s image of taking the lead in every age based on optical technologies developed over its long history. NIKKOR’s history began in 1932 with Nikon’s (then Nippon Kogaku K.K.) registration of the NIKKOR trademark, soon followed in 1933 with the first shipment of Aero-Nikkor aerial photographic lenses. 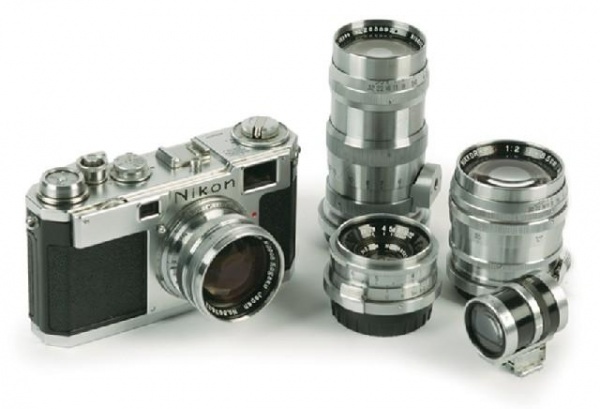 Since then, Nikon has continued to develop lenses for both film and digital cameras. Always loaded with cutting edge optical technologies of the times, NIKKOR has grown to be a brand known for high-performance lenses. In 1959, Nikon (then Nippon Kogaku K.K.) released its first SLR camera, the Nikon F as well as its first lens for Nikon SLR cameras, the NIKKOR-S Auto 5cm f/2. The Nikon F mount, adopted for the Nikon F, continues to be the mount used in the latest Nikon digital-SLR cameras. In addition, with the release of the new Nikon 1 series of advanced cameras with interchangeable lenses incorporating the new 1 mount, Nikon has steadily released dedicated 1 mount lenses developed with optical technologies cultivated over the years, advanced technologies, and offering the superior image quality users have come to expect since 2011. As a result, total production of NIKKOR lenses for cameras with interchangeable lenses reached 75 million in November 2012. NIKKOR lenses are not limited to use by cameras with interchangeable lenses but are also integrated into Nikon’s COOLPIX series of compact digital cameras. Thus, NIKKOR lenses have been well received by a broad range of users, from entry-level to professional photographers. Nikon’s lineup of lenses for cameras with interchangeable lenses currently consists of more than 80 types of lenses, including fisheye lenses, ultra wide-angle lenses, super-telephoto lenses, zoom lenses, micro lenses, PC-E lenses, and 1 NIKKOR lenses for advanced cameras with interchangeable lenses. Nikon will continue to develop high-quality NIKKOR lenses that attract a wide variety of photographers. NIKKOR is Nikon’s brand of photographic lenses. The NIKKOR name arose from adding “r”—a common practice in the naming of photographic lenses at the time the name was established—to “Nikko”, the Romanized abbreviation for Nippon Kogaku K.K., the original name used when the company was established. The OP Fisheye-Nikkor 10mm f/5.6 fisheye lens for SLR cameras, released in 1968, was the world’s first lens to incorporate aspherical lens elements. The Ultra Micro-Nikkor 105mm f/2.8, released in 1962, served as the template for projection lenses employed in Nikon IC steppers and scanners that currently boast some of the highest resolutions in the world. What’s more, NIKKOR lenses for the latest SLR cameras utilize a number of cutting-edge technologies that originated with the development of IC steppers and scanners, including Nano Crystal Coat, which virtually eliminates internal lens element reflections across a broad range of wavelengths. From initial design to final packaging, production and quality is controlled in accordance with Nikon’s strict standards. The superior quality of NIKKOR lenses that respond to the needs of users is ensured with the highest quality designs and manufacturing, as well as very strict quality inspections.